ForexNewsNow – NordFX offers a great deal of cutting edge tools and innovative account types to attract nearly every type of trader from novices to experienced traders. While they are a dealer, they also provide access to ECNs that give you the same quotes and execution times that institutional clients can receive. They also allow every type of trader, so if you’re a scalper or use any other type of high frequency trading strategy you don’t have to worry about your account being banned. However, if you are an American you won’t be able to trade through NordFX because they also allow contract for difference (CFD) trading. They also don’t have the same amount of educational materials and news compared to other top forex brokers. But, if these downsides aren’t important to you, NordFX is definitely worth a look. NordFX currently offers over 28 different currency pairs, CFDs, and precious metals for trading. Unlike other online forex brokers, they unfortunately don’t offer much in the way of contests and promotions. They only offer one contest each month for the top traders on their demo account platform. However, with this you can win real money by trying out your trading strategies with the play money in your demo account. One feature that will attract many traders is the fact that NordFX hedges all their trades automatically, letting you use any trading style that you want. This makes NordFX one of the best forex brokers for scalpers, hedgers, and traders that use other types of high frequency trading. NordFX offers several different types of platforms. The most popular are the MetaTrader4 and MetaTrader5 platforms. MetaTrader is the gold standard in forex trading, and for good reason. It gives you unparalleled control over your trades and is the most reliable and flexible trading platform on the market today. For traders that aren’t ready for trading on their own through MetaTrader yet, NordFX offers the ZuluTrader platform. With ZuluTrader, you don’t need to come up with your own trading system, you simply pick a professional trader that you want to follow and the software will follow their trades automatically. It gives you a low deposit threshold, so you can get started quickly and easily, and if you choose you can manually control the trades as well. Another option for traders is the CQG platform. This platform is for traders that don’t need technical analysis and instead trade on velocity and saturation. The software quickly lets you see the depth of the market and manage you orders. It comes with grade charting, signals for several different indicators, and the ability to make your own trading system. 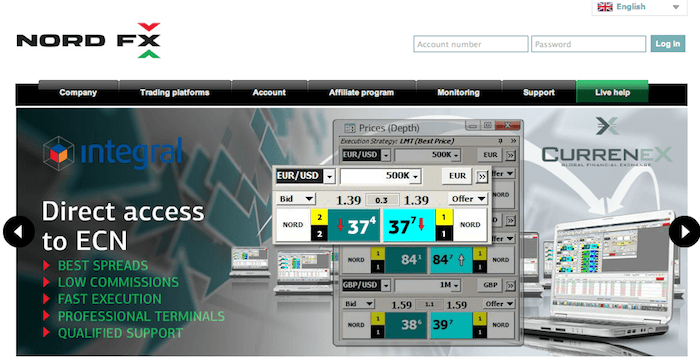 Finally, for heavy traders, NordFX, like many top forex brokers, gives you access to the Integral trading platform. This is one of the world’s leading ENC systems and is used by many banks, Fortune 500 companies, and other large investors. The welcome account is an account type that you will only find at NordFX. It is identical to the micro account, but comes with an $8 balance immediately after signing up and verifying the account. Instead of just offering you a demo account, like most other online forex brokers do, with NordFX you can trade with real money and keep all of your earnings while you figure out if it’s the best forex broker for you. The micro account is designed so that beginners can start to trade without any assistance. It has a $5 minimum deposit, making it one of the lowest initial deposits in the industry and offers you 21 different pairs to trade, fixed spreads from 2 pips and leverage up to 1:500. A Zulu Trade account gives you access to automatic trading that follows the actions of industry professionals. By viewing and analyzing their strategies, you can get the knowledge and know-how that you need to succeed on your own. Minimum deposit is $50, you can trade 44 different pairs along with gold and silver, and you are able to leverage your money up to 1:200. Standard accounts are for experienced traders and give you access to a wide range of tools and services. You get tight spreads, fast execution, and immediate hedging of your positions. There is a $50 minimum deposit and you can trade 44 currency pairs with leverage up to 1:200. Professional traders can open Integral, MetaTrader5, and MT-ECN accounts to allow them to trade with ECN interfaces to get the best spreads and fastest execution times. NordFX allows for fixed or floating spread accounts. Spreads range from 1 pip to 20 pips on more exotic currency pairs. Customer support is available through email, phone and live chat. NordFX is registered in Panama and Mauritius and authorized by Ministry of Industry and Commerce of Panama and the Financial Services Commission of Mauritius.